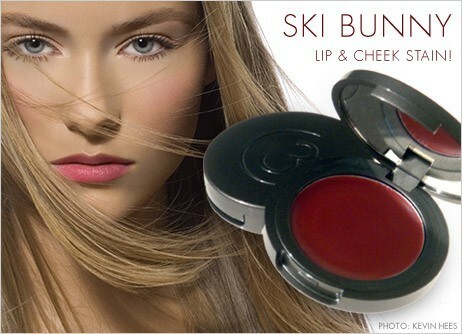 When the winter doldrums threaten to strike, fight back with the perfect antidote, Ski Bunny Lip & Cheek Stain. If you think back to past winters, you probably never looked or felt better than when you were out in the chilly air - skiing, sledding, skating…or even holiday shopping! Just a dab of Ski Bunny Lip & Cheek Stain on the lips and cheeks will mimic that healthy, flushed, fresh-off-the-slopes radiance – all without dipping a toe in the snow! This sheer cherry balm with a swirl of shimmer will brighten any skin tone with a fresh and youthful, yet appropriate for all ages. What’s better, this unique dual-purpose product is infused with nourishing, protective beeswax to stave off winter dryness. This slim compact fits into the tiniest purse or pocket and comes equipped with a mirror so it's perfect for on-the-go pick me ups. The pigment packs a punch so a little bit goes a long way! This sheer cherry balm with a swirl of shimmer will brighten any skin tone with the dab of a finger, creating a glow that is fresh and youthful, yet appropriate for all ages.